I know I said I would be bowing out of blogging for the next week but I have some time today, so I thought I would share a review with you. Does this mean my professional clothing should lack color? Absolutely not! So on my quest to find professional, yet colorful and interesting work wear, I discovered eShakti. eShakti's tag line is "You Design, We Customize." A customer is never told an item is out of stock in their size as one can either choose standard sizing OR customize, sometimes even changing the overall style of a piece of clothing. How does this work? 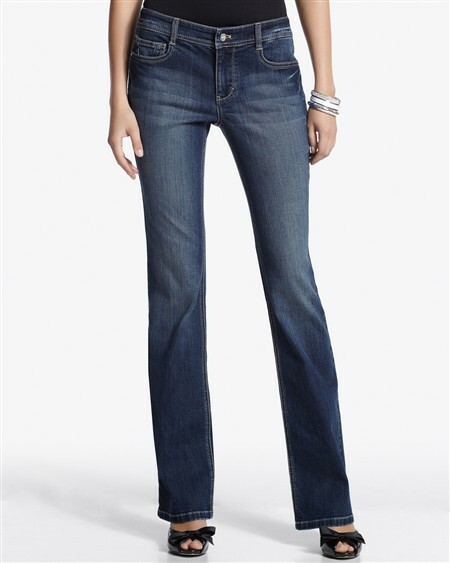 Measure your hips, arms, bust, waist and enter in your measurements when ordering a piece of clothing. Then customize your sleeves to be long, short, capped, sleeveless, 3/4 length. You can also choose the length of your dress or skirt. All orders, even custom, arrive on your doorstep in seven days. Their prices are also very reasonable. 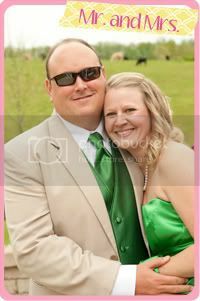 The dress I chose is seen below. It is a shiny, lightweight wrap dress with pops of yellow at a cost of $59.95 (if I recall correctly). It wraps and ties on one side with buttons on both the right and left hand interior sides to keep the wrap in place. I was very pleased with this feature as wrap dresses sometimes either have a hole through the dress (which often gets torn) or there is no holding place, causing the dress to fall lose and constantly be re-tied. The buttons were also quite strong and large for flexibility in sitting and standing. It is a great dress for professional wear, in my opinion, and something different from anything else I own in my closet (including my typical color palette). I do enjoy wearing this dress. I am very pleased with the shipping time, which was seven days as promised, and the dress fit perfectly according to my measurements. It is comfortable for all day wear and very flattering in the fit. I received several compliments from ladies in my office with one actually going on the site to order some custom dresses for herself. I only have two complaints and one is the length of the dress. It is longer than I expected where I would prefer it to be above the knee rather than at the knee. I also received this same comment from the ladies at my office, that the dress was a tad too long. I did enter the height into the form however, either I didn't measure correctly or the measurement I gave was interpreted to be this particular length. When I order again, I will take a couple inches off of my height for this purpose. (As a side note, I had Husband measure me, I would not advise doing this yourself. I also read the directions given by eShakti on how to measure). The other complaint is the bust area, which I'm sure is related only to this particular dress. The dress wraps across the bosom a little too low (without bearing too much, here is a close up). It appears eShakti recognized this and to compensate, they added a button and buttonhole to close the area. The button fits awkwardly and is quite noticeable, not being very well hidden. I found myself fooling with it much of the day so it didn't stand out. This was one of the other comments from the ladies in my office, that the button was quite noticeable and they wondered why it looked this way. Someone recommended removing the button all together and using fabric tape. All-in-all, I am please with eShakti's selection and service and will likely be ordering from there for professional work wear in the near future. Happy Friday Y'all and once again, Happy Thanksgiving! Since Ashleigh so snarkily reminded me that I'm not physically moving to Alaska and I don't need arctic weather clothing, I took it to heart and didn't go crazy with sweaters. And being that I have little time to run to Palm Beach to my normal shopping venues of Nordstrom, Saks, Lilly, Tory Burch etc. (okay, so I wasn't planning to spend THAT kind of money, but I can dream! ), I stuck with White House Black Market, Target and Ann Taylor Loft. Now I'm not one to buy something just for the sake of buying something, so if I don't absolutely love it, I will not buy it. So, I spent a whopping 35 minutes trying to decide between two different sizes of the same pair of jeans at White House Black Market. Here's what I picked up over the past couple days during lunch breaks. I'm pretty happy with my choices. 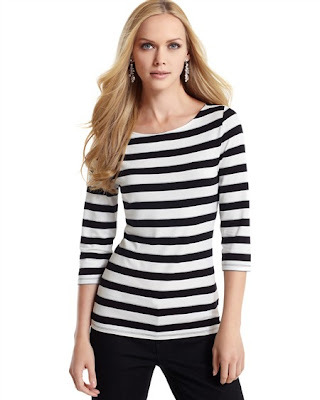 From White House Black Market, I purchased this striped keyhole top (keyhole on the back) and Blanc jeans (not black jeans, "blanc" jeans, which the word "blanc" means "white" in French, so not sure of the rationale here as they are clearly not white jeans). I tried on this sweater at WHBM and LOVED it, but at $98.00 and it being a fairly heavy sweater that won't be worn often, I passed. It would look SO cute with skinny jeans and black boots (which I don't have the boots....yet). Between BHWM and the Loft was Old Navy. 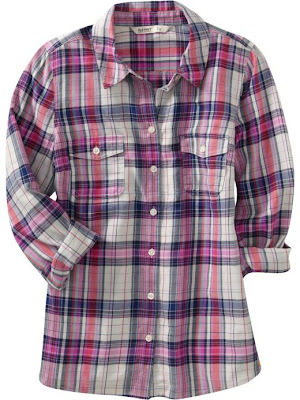 I spied this cute little flannel shirt, soft as can be and scooped it up for $24.94. Not a bad deal for a casual/lounging shirt. At the Loft, I picked up this flattering peasant top and a preppy cable knit v-neck sweater. And at Target, I picked up this cute grey sweater to wear with black leggings and my black Revas. Now for the shocking part! I purchased clogs! Oh, yes I did! Furry clogs at Target for $29.99 and they are comfy and super cute with cords though I don't see myself wearing them with anything but cords. I won't wear them that often, so I didn't mind not spending a huge amount of money. So, what do you think of my finds? Not bad for some on-the-fly buys before our Thanksgiving trip. I think I was able to spend money wisely while buying versatile items that I can wear both north and south. I'm bowing out for a few days but will see you the Monday after! 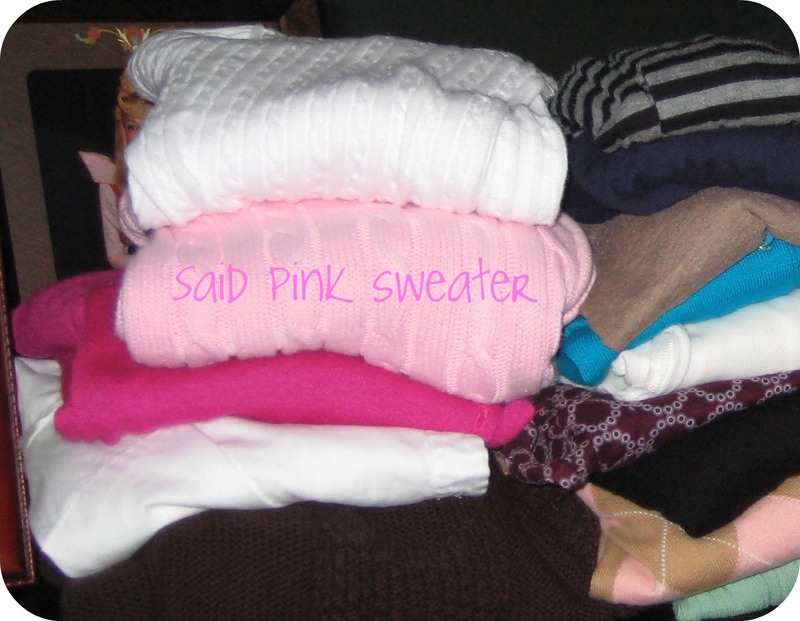 Fall (North) Wardrobe - A Cry for Help! Sweet, generous Husband told me to go shopping today, to brush up my fall (north) wardrobe before leaving for an extended Thanksgiving vacation. Why, you might ask, would I call it my "fall (north) wardrobe?" Because my fall (south) wardrobe is not appropriate for fall (north) fashions as it's significantly colder up north for longer periods of time. Who knew? And...this is the extent of my fall (north) wardrobe. I should probably mention that most of it is well over five years old. I'm surprised the sweaters aren't moth eaten (wait, do we have moths in South Florida? I don't think I've ever seen one....something to google). I pulled out my favorite pink Ralph Lauren to which Husband replied, "Really, you're going to take that north again? Our north vacation memories are all running together because you've worn that sweater EVERY year for the last five and it's in EVERY picture!!" blue Polo Ralph Lauren horse. Yep, time to go shopping. But wait....I'm confused. 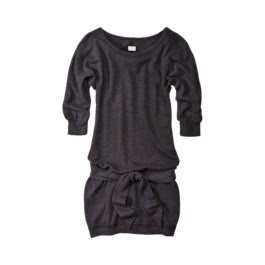 What does one shop for when planning north outfits? You see, I don't layer and after eleven years of Florida living, I've forgotten how to layer! Not to mention, I'd like to stay in a relatively decent budget while looking adorably preppy. And sweaters, they need to be lightweight. Oh and shoes! There's another one. 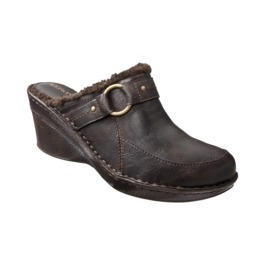 What type of brown flats does one wear with cords? Revas, Toms, boots? They all look funny to me (please don't say clogs....I will NOT....I repeat....will NOT wear clogs, unless those are the in thing. Are clogs "in?" Ack! This is going to be an interesting shopping trip and I have a total of two days and maybe two hours in which to complete this. Saturday, I had the unique opportunity to attend the Preppy American Brunch to celebrate Lilly Pulitzer Rousseau's 80th birthday at the Museum of Lifestyle and Fashion History in Boynton Beach. 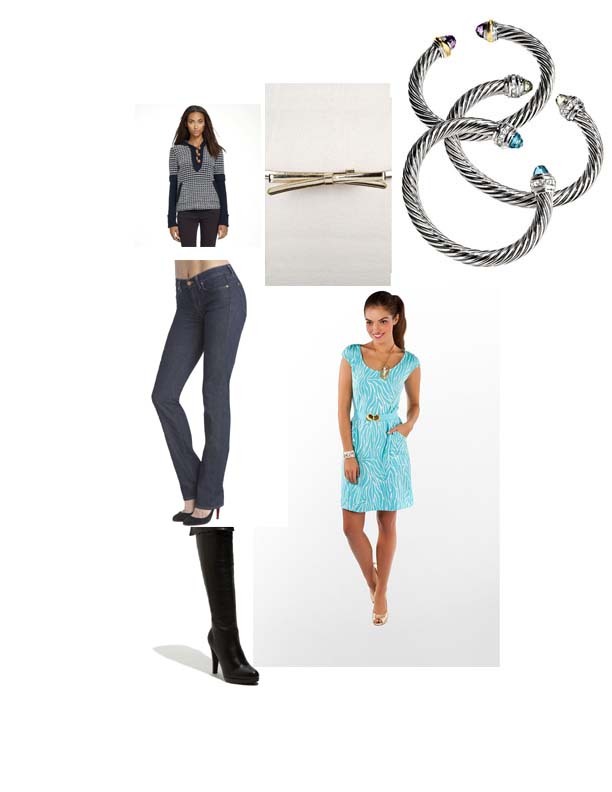 Lilly was dressed in a Murfee scarf and a cashmere sweater and gorgeous green earrings. She was extremely gracious and warm with lots of hugs and hand holding, making time for every single person at the party. Lilly, I believe, was almost as starstruck as the rest of us, seeing all the people and children, dressed in her clothing. She was so charming and witty and complimented everyone in their lovely dresses. 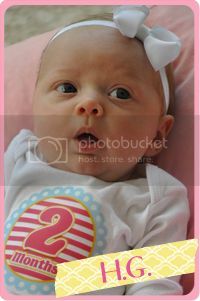 She was so excited the several had come from so far away to celebrate with her. 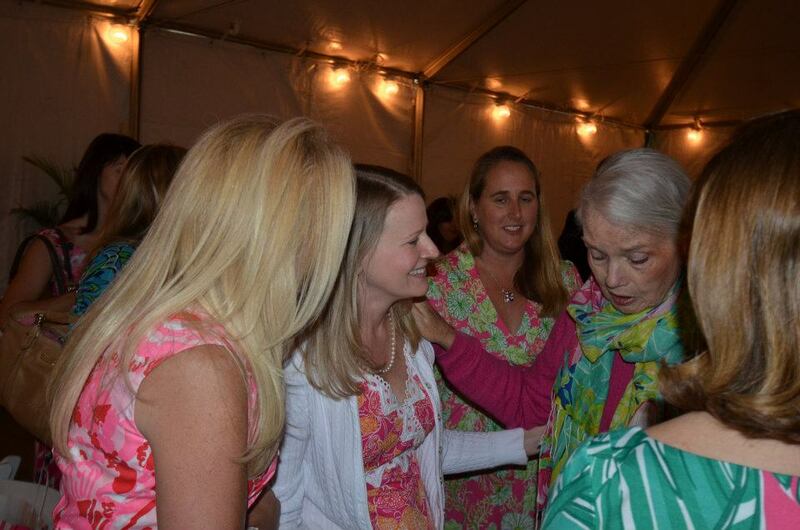 Amy from Forever 29 with Lilly Pulitzer. Notice the hand holding. Lilly is one classy and loving lady. The party, which was much more intimate than I expected with just over 100 people, was one of the most colorful events I've ever attended. Of course, it's Lilly! So what else could one expect! The tables were all decorated in Lilly printed table cloths with Florida fruit centerpieces such as oranges and grapefruits. 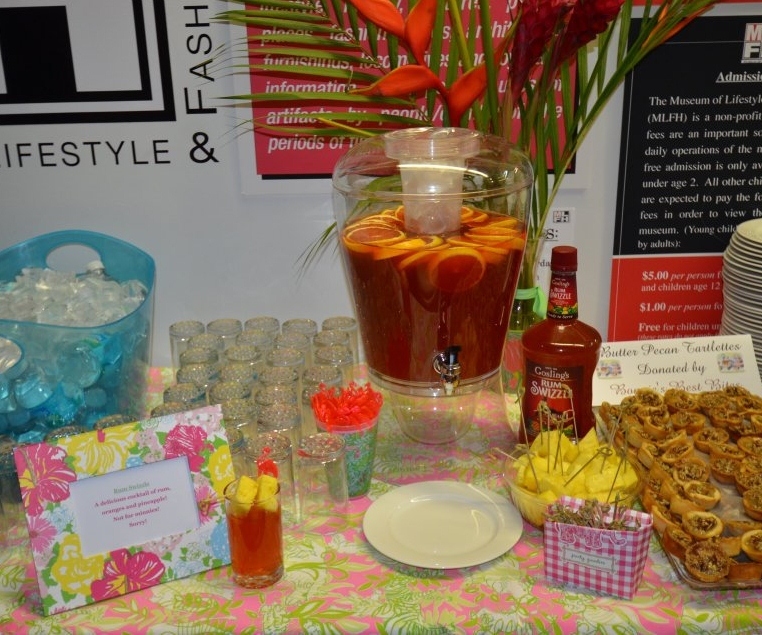 The brunch was catered by a fabulous local establishment called Toojay's and rum punches with adorable flamingo stir sticks were the signature drinks. Swag bags provided by C. Orrico were filled with goodies including a preppy bracelet from Kiel James Patrick, swag from Vineyard Vines and chocolates. The silent auction included Lilly vintage items including headbands crafted by Looking 4 Lilly and aprons from L. Whelan Designs. Several bloggers were in attendance including Petunia In Paradise, Bethany from Maryland Pink and Green, Amy from Forever 29 and Wendy from Life is Better with a Twist of Lime. Ashley from Ashley Brooke Designs also came in for the occasion. Kiel James Patrick also attended with his girlfriend, Sarah Vickers. Kiel toasted Lilly, thanking her for leading us in a colorful lifestyle and then led us in singing Happy Birthday. The museum displayed several vintage Lilly pieces and models walked the reception area showing off Lilly Pulitzer fashions, new and old. Barbara Malone, one of the organizers of the Preppy American Brunch event. 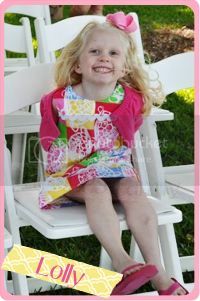 And of course, I can't forget little Lallie, who also celebrated Lilly's birthday in her favorite tunic. She was thrilled to receive the cupcake I brought home and enjoyed looking at all the pictures of the party with me. But one thing I CANNOT wait to tell y'all about is The Preppy American Brunch celebrating Lilly Pulitzer Rousseau's 80th birthday!! 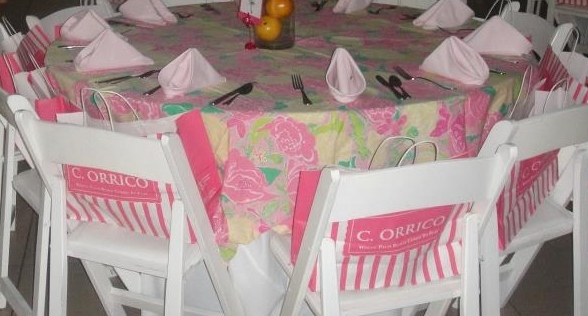 It's this Saturday and I'm meeting up with a couple blog friends and local friends for a Lilly filled luncheon! 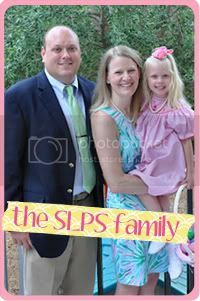 But for now....here's some pictures of what the SLPS household has been up to! A week after Halloween and the goblins are still among us! Yikes! Getting ready for Christmas already. Lallie loves the Sunday papers and all the toy flyers. Horseback riding at the church fall festival right after dance class! She's a busy girl! And last but not least, a little video as Lallie has managed to squeeze word invention into her busy, busy schedule!